Unfortunately, more than 50% of the diabetic subjects remain unaware of their diabetes status, which adds to the disease burden. ,, The average lag between onset and diagnosis of type 2 diabetes mellitus is 7 years. It is also now established that microvascular and macrovascular complications are sometimes present, even in prediabetics impaired fasting glucose (IFG) or impaired glucose tolerance (IGT). Early detection of diabetes, in addition to its potential for identifying retinopathy, could also find peripheral neuropathy and microalbuminuria as well as the markedly increased risk of macrovascular disease. These realities support the need to identify diabetes and its precursors more efficiently and earlier. According to WHO estimation of fasting blood glucose is the highly effective method for diagnosing diabetes mellitus. Measurements of fasting blood glucose levels provide a short-term picture of control. When plasma glucose is consistently elevated, there is an increase in nonenzymatic glycosylation of hemoglobin, and this alteration reflects glycemic history over the past 2-3 months as red blood cells have a lifespan of 120 days. To improve patient's compliance with testing, use of glycosylated hemoglobin levels to diagnose diabetes has been suggested. Finally, its correlation with the subsequent development and progression of the microvascular and neuropathic complications of diabetes was clearly proved in the diabetes control and complications trial (DCCT)  for type I diabetes as well as in the Pima Indian and Japanese  populations for type II diabetes. The present hospital-based cross sectional study was conducted in outpatient clinic of Maharishi Markandeshwar Institute of Medical sciences and Research, Mullana, Ambala India. Diabetic patients attending outpatient clinic of various departments of institute constituted the study population A total of 300 patients were selected by simple random sampling method with the following inclusion and exclusion criteria. Individuals above 25 years of age were included in the study. Patients who were already on drug treatment for diabetes were also taken. Participants who gave informed and written consent and were willing to participate were taken for the study. Individuals below 25 years of age. Participants who did not give informed and written consent or were not willing to participate were not taken for the study. Informed consent following ethical guidelines of World Medical Association Declaration of Helsinki was taken. Only such respondents with informed consents were included in the study. Permission from ethical committee and research committee of the institution was taken before submitting the research proposal for approval to Indian Council of Medical Research. Hospital-based study was conducted. Participants were interviewed individually using pretested, predesigned schedule. They were clinically examined to find out other parameters. The level of fasting blood glucose and HbA1c was assessed using a standard technique. Blood glucose was measured by Trinder's Method and HbA1c was measured by ion exchange chromatography. A pattern of HbA1c was noted and further correlation between FPG and HbA1C was also calculated. Indian diabetic risk score of the patient were also calculated. Data was analyzed using SPSS 15.0. To study patterns of glycemic control percentages were calculated. Linear regression analysis and Pearson's correlation was used to determine the relationship between HbA 1c and FPG. FPG was included as explanatory variables of HbA 1c in linear regression analysis. A total of 300 patients who were more than 25 years of age and diagnosed to be suffering from diabetes were included in the study. Out of total cases, 176 were males and 124 were females. Hundred cases were from 51-60 years of age and 72 each from 31-40 and 61-70 age groups. Eighty-four (28%) were housewives, 56 were unemployed, and 52 were farmers [Table 1]. Overall 30% patients were suffering from diabetes for less than a year whereas 29% had the same health problem for 1-3 years. Twenty percent of the subjects had diabetes for 3-5 years and 21% were suffering from the disease for more than 5 years. On assessing the level of physical activity of the participants, 39% had sedentary life style, 35% were involved in mild to moderate physical activity whereas 26% were involved in heavy physical activity [Table 2]. On enquiring about the family history of diabetes in the study subjects, 69% reported having positive family history whereas 31% gave no history of diabetes in their families. The mean body mass index of the participants came out to be 25.6108 (S D ± 3.5084). The mean waist hip ratio was 0.9883 (S D ± 0.0963), the mean FPG was 146.5876 (S D ± 53.61) and the mean HBA1c came out to be 8.76 (S D ± 1.05) [Table 3]. Thirteen percent of the study subjects had HbA1c between 6.5-7.5, more than half (57.3%) had this value between 7.5-8.5, 12% and 18% had values between 8.5-9.5 and 9.5-10.5, respectively. Twelve percent of the participants had HbA1c level higher than 10.5. Fifty-two percent of the population had FPG level between 125-150 mg/dl, 21% had this level between 151-175 mg/dl while 16% of them had normal FPG level. On cross tabulation of FPG and HbA1c it was observed that 36 individuals who have HbA1c in the range of 7.5-8.5 had normal FPG. Eight and four cases were found to have HbA1c in the ranges of 9.5-10.5 and more than 10.5, respectively. Out of 172 cases whose HbA1c was in the range of 7.5-8.5, 116 had fasting level of glucose between 125-150 mg/dl [Table 4]. Correlation of FPG level and HbA1c was also studied and correlation coefficient came out to be 311. This correlation was found to be statistically significant (P = 0.007). On linear regression analysis of the HbA1c, taking HbA1c as independent variable and FPG as state variable. It was observed that HbA1c and FPG has linear relation (P = .007) [Figure 1]. Indian diabetic risk score was calculated and it was observed that 65% of the case had IDRS higher than 60 whereas 35% of the diabetic had IDRS lower than 60. The relationship between HbA1c and plasma glucose is complex. Many studies have shown that HbA1c is an index of mean plasma glucose over the preceding weeks to months as erythrocyte life span averages 120 days. Therefore, once glycosylation occurs the concentration of HbA1c does not vary day to day and is unaffected by diet, insulin, other hypoglycemic drugs or exercise on the day of investigation contrary to estimation of blood glucose. By forming a cross tabulation between glycosylated hemoglobin and FPG, the patterns of glycemic control of patients was studied. It was seen that even though there were some patients who had their FPG levels below the levels of diagnostic criteria (125 mg/dl) their HbA1c levels were found to be well above the normal range. This tells us that FPG alone is not a sufficient test to diagnose a patient as diabetic as there is a possibility of giving false results. The explanation to this can be that a patient may alter his activities or diet a night before taking the test, or may get anxious or nervous before the test, which may lead to an abnormal rise in the blood glucose levels. The importance of HbA1c levels lies in the fact that it states a brief history of the patients' glycemic control over the duration of last 2 to 3 months. By establishing a correlation between HbA1c and FPG levels it was proved that the levels of glycosylated hemoglobin are in accordance to the levels of FPG and hold significance in establishing a diagnosis. As the levels of HbA1c also rise as the FPG rises, this can also be used for predicting an abnormality in the homeostasis of carbohydrate metabolism. But since some studies like the one by DESIR group concluded HbA1c to be a good predictor of diabetes with the risk increasing exponentially in both sexes. However, it was found that there was an HbA1c threshold below which the incidence of diabetes was found to be very low and above which the incidence was found to be considerably higher. However, it was found that HbA1c is less sensitive and specific than FPG for diabetes in the entire population. The findings of our study are in accordance with the above study. Calculating the IDRS of the patients based on their demographic and clinical risk factors helps us validate the IDRS and is thus can be efficiently used in determining individuals at risk. An IDRS of more than 60 has been suggested as a significant risk factor for the development of diabetes. As most of our study population had an IDRS above 60, this proves that majority of the patients who are suffering from type-2 Diabetes Mellitus had these risk factors. Early identification of risk factors can prevent or delay the onset of diabetes and proper intervention by modification of diet or exercise can lead to a better improved lifestyle. The clinical importance of the present study is that by using glycosylated hemoglobin, FPG and IDRS we can diagnose type-2 diabetes mellitus early and prevent any unwanted complications, plus if FPG is elevated and is not in accordance with the other two, a retest on a different occasion can be done and this can prevent any undue modifications in lifestyle or any mental depression from a misdiagnosis. Even though the study was done with accuracy and precision but there are certain limitations that may have influenced the outcomes of the whole study. There is a possibility of bias in the results as HBA1c levels may vary with some intrinsic or extrinsic factors. One of such factor that holds a lot of importance in developing countries is iron deficiency Anemia. Iron deficiency anemia may lead to rises in the levels of HBA1c that are reversible on treatment with iron. Another factor which may alter the levels of HBA1c is a high dose of Aspirin, which can lead to spurious rise in levels of HBA1c due to formation of acetylated hemoglobin. Disorders like renal failure, hemoglobinopathies (like sickle cell anemia, spherocytosis etc) can alter levels of HbA1c and lead to faulty results. The study population was small and mainly involved rural population. Since our results were consistent with findings of researchers in different part of the world, this study has added to the evidence that FPG with HBA1c improves diagnostic accuracy. It gives better estimate of diabetic status. One of the other limitations about this study is the lack of the data from controls, since the study was limitedly funded, it was not possible to take the samples of controls and repeat the tests on those samples. The study population included majority of rural population, who are illiterate and are either believers of quacks or are not able to specify their current treatment due to lack of knowledge. The patterns of the glycemic control illustrates that even in cases with FPG level below the diagnostic criteria (125 mg/dl) glycosylated hemoglobin can be in abnormal range. Therefore, even though FPG is considered a gold standard test for diagnosing diabetes, it may give false negative results measurement of glycosylated hemoglobin is an important component for diagnosis of a diabetic patient, so a test for HbA1c should be included in the diagnostic criteria for diabetes along with FPG or OGTT. Measurement of glycosylated hemoglobin levels can also be used in monitoring the efficacy of treatment of an individual and can be used to find any need for a change. It was seen that majority of the subjects had an IDRS above 60; thus, this indicates the significance of IDRS in determining the population at risk for developing diabetes. IDRS can be used as a screening tool for diabetes. Development of diabetes can be prevented or well delayed by identifying risk factors by the individual himself. This can be brought about by educating the mass about importance of IDRS and how to calculate their own IDRS and bring the appropriate changes in their lifestyle. 1. Zimmet P, Alberti K, Shaw J. Global and societal implications of the diabetes epidemic. Nature 2001;414:782-7. 2. Mohan V, Shanthirani S, Deepa R, Premalatha G, Sastry NG, Saroja R. Intra-urban differences in the prevalence of the metabolic syndrome in Southern India - the Chennai Urban Population study. Diabet Med 2001;18:280-7. 3. Mohan V, Jaydip R, Deepa R. Type 2 diabetes Asian Indian youth. Pediatr Diabetes 2007;8 Suppl 9:28-34. 4. Yang W, Lu J, Weng J, Jia W, Ji L, Xiao J, et al. Prevalence of diabetes among men and women in China. N Engl J Med 2010;362:1090-101. 5. Sadikot SM, Nigam A, Das S, Bajaj S, Zargar AH, Prasannakumar KM, et al. The burden of diabetes and impaired glucose tolerance in India using the WHO 1999 criteria: Prevalence of diabetes in India study (PODIS). Diabetes Res Clin Pract 2004;66:301-7. 6. Anand K, Shah B, Gupta V, Khaparde K, Pau E, Menon GR, et al. Report of the surveillance of risk factors of non-communicable diseases (STEPS 1 and 2) from five centres in India. WHO India: ICMR initiative; 2006. 7. Engelgau MM, Geiss LS, Saaddine JB, Boyle JP, Benjamin SM, Gregg EW, et al. The evolving diabetes burden in the United States. Ann Intern Med 2004;140:945-50. 8. Mooy JM, Grootenhuis PA, de Vries H, Valkenburg HA, Bouter LM, Kostense PJ, et al. Prevalence and determinants of glucose intolerance in a Dutch Caucasian population: the Hoorn Study. Diabetes Care 1995;18:1270-3. 9. Dunstan DW, Zimmet PZ, Welborn TA, De Courten MP, Cameron AJ, Sicree RA, et al. The rising prevalence of diabetes and impaired glucose tolerance: The Australian Diabetes, Obesity and Lifestyle Study. Diabetes Care 2002;25:829-34. 10. Heine RJ, Mooy JM. Impaired glucose tolerance and unidentified diabetes. Postgrad Med J 1996;72:67-71. 11. Samuels TA, Cohen D, Brancati FL, Coresh J, Kao WH. Delayed Diagnosis of Incident Type 2 Diabetes Mellitus in the ARIC Study. Am J Manag Care 2006;12:717-24. 12. Saudek CD, Herman WH, Sacks DB, Bergenstal RM, Edelman D, Davidson MB. A New Look at Screening and Diagnosing Diabetes Mellitus. J Clin Endocrinol Metab 2008;93:2447-69. 13. Liberopoulos EN, Florentin M, Kei A, Mountzouri E, Agouridis A, Elisaf MA. Comparison of Hemoglobin A 1c and Fasting Glucose Criteria to Diagnose Diabetes Among People With Metabolic Syndrome and Fasting Glucose Above 100 mg/dL (5.5 mmol/L). J Clin Hypertens (Greenwich) 2010;12:543-8. 14. Motta M, Bennati E, Cardillo E, Ferlito L, Malaguarnera M. The value of glycosylated hemoglobin as a predictive risk factor in the diagnosis of diabetes mellitus in the elderly. Arch Gerontol Geriatr 2010;50:60-4. 15. Hashimoto Y, Futamura A, Watanabe N, Togo M, Sato H, Hara M, et al. Relationship between glycosylated hemoglobin and the prevalence of proteinuria in Japanese men. Intern Med 1999;38:6-11. 16. Mohan V, Deepa R, Deepa M, Somannavar S, Datta M. A Simplified Indian Diabetes Risk Score for Screening for Undiagnosed Diabetic Subjects. J Assoc Physicians India 2005;53:759-62. 17. Powers AC. Diabetes mellitus. In: Fauci AS, editor. Harrison's principles of Internal medicine. U.S.A: Mc GrawHill; 2009. p. 2275-304. 18. Reynolds TM, Smellie WS, Twomey PJ. Glycated Hemoglobin monitoring. BMJ 2006;333:586-8. 19. American college of endocrinology consensus statement on guidelines for glycemic control. Endocr Pract 2002;8(suppl 1):5-11. 20. Qvist R, Shah I, Ismail, Chinna K, Muniandy S. Use of Glycated hemoglobin and impaired glucose tolerance in the screening of undiagnosed diabetes in the Malaysian population. Indian J Clin Biochem 2008;23:246-9. 21. Malati T, Krishna DM, Srinivasan VR, Shantharam V. Glycosylated hemoglobin a ~ in a random group of adult onset diabetics of Indian subpopulation. Indian J Clin Biochem 1992;7:138-42. 22. 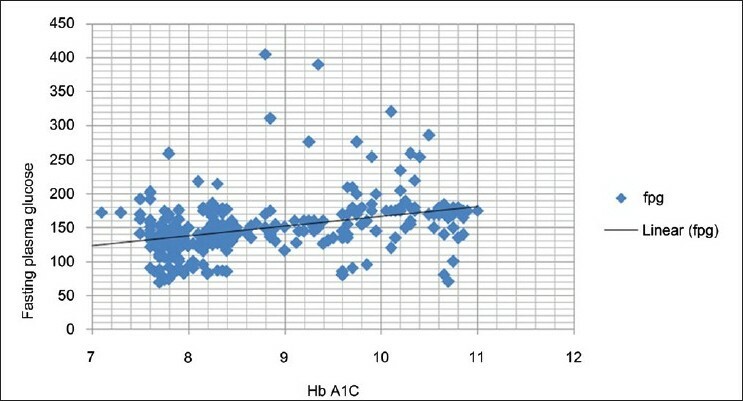 Droumaguet C, Balkau B, Simon D, Caces E, Tichet J, Charles MA, Eschwege E. Use of HBa1c in predicting progression to diabetes in French men and women. Data from an Epidemiological Study on the Insulin Resistance Syndrome (DESIR). Diabetes Care 2006;29:1619-25. 23. Davidson MB, Schriger DL, Peters AL, Lorber B. Relationship between fasting plasma glucose and glycosylated hemoglobin: Potential for False-Positive Diagnoses of Type 2 Diabetes Using New Diagnostic Criteria. JAMA 1999;281:1203-10. 24. Mulkerrin EC, Arnold JD, Dewar R, Sykes D, Rees A, Pathy MS. Glycosylated hemoglobin in the diagnosis of diabetes mellitus in elderly people. Age Ageing 1992;21:175-7. 25. Yoshinaga H, Kosaka K. High glycosylated hemoglobin levels increase the risk of progression to diabetes mellitus in subjects with glucose intolerance. Diabetes Res Clin Pract 1996;31:71-9. 1 Poor control and management of type 2 diabetes mellitus at an under-resourced South African Hospital: is it a case of clinical inertia? An, G.-J. and Kim, M.-J. Riga, M. and Kefalidis, G. and Danielides, V.